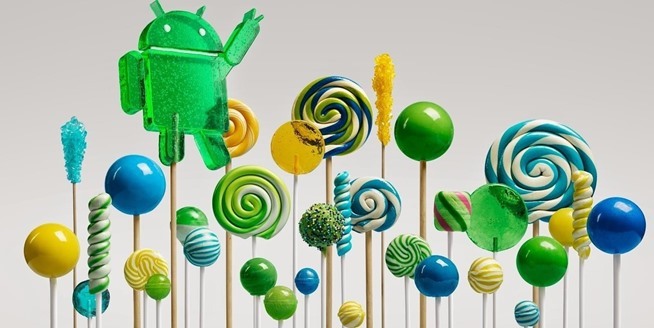 Google recently announced the release of a new version of its mobile open source operating system – Android Version 5.0 named Lollipop. 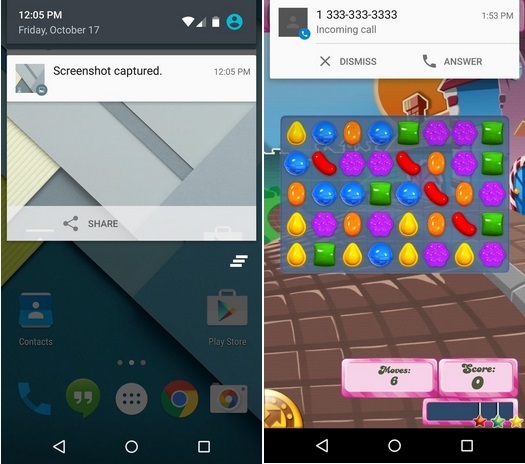 This upgrades mean new features have been added to the Android OS. So in this article, I want to look at 7 new features of the Android 5.0 Lollipop especially on the visual look of the OS since most recent upgrades tints towards more visual changes. New accents, beautiful animations, and a lighter overall color palette mark some of the more dramatic user-facing changes, and more robust features and options push the whole experience forward. If you’re curious to see what Google’s been up to this past year, we’ve got you covered here with an overview of the changes. 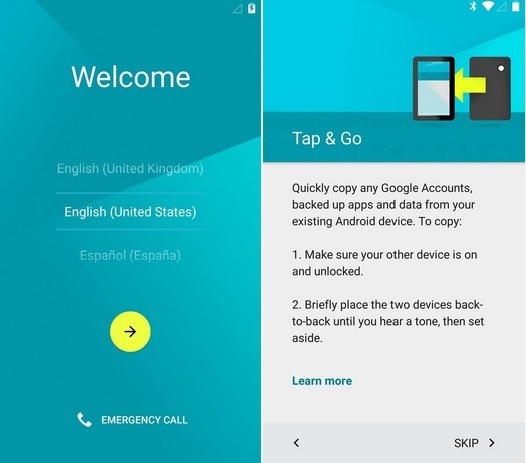 Google has introduced a new initial setup menu that appears the very first time you power your Android device running the Lollipop OS version. You can now simply setup your device in your preferred languages and settings, importing your data from an older device easily. A new Tap & Go feature lets you easily transfer apps, data, and account info from your old device. Just touch two NFC-enabled devices together, and the rest of setup will take care of itself. 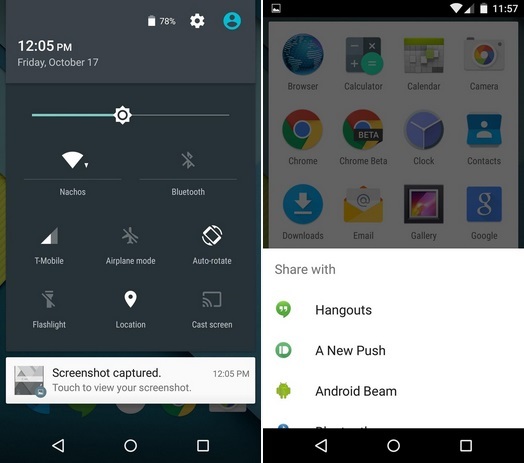 The Android home screen on version 5.0 looks better. Material Design elements have been added to most of the icons. The App Drawer is now presented in a paginated, windowed format, and the background color has shifted from black to white. A new transition animation occurs when you open App Drawer button, with the list of apps expanding outward from the All Apps button. 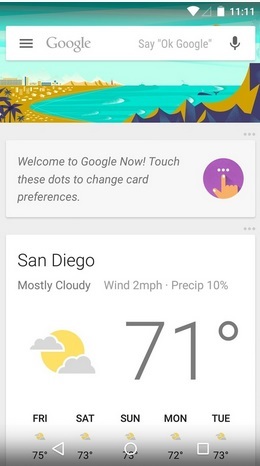 Check out the new Google Now interface, it’s been updated to include a slide-out navigation drawer in the new Android Lollipop version. 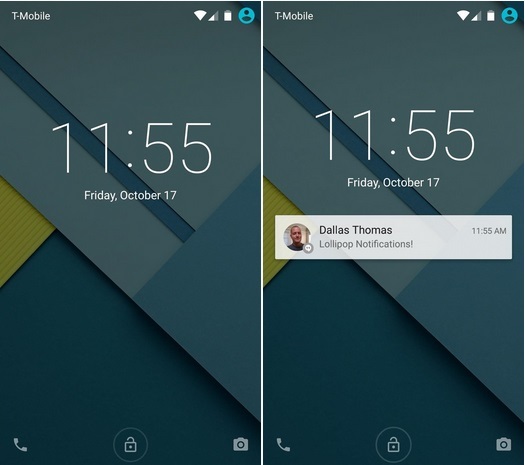 You can now view notifications on the Lollipop lock screen even without unlocking your device. The camera shortcut still resides at the bottom-right corner, but a new Phone icon now sits opposite of it. The screen is unlocked by swiping upward, but swiping left or right from any point takes you directly to these commonly-used apps. 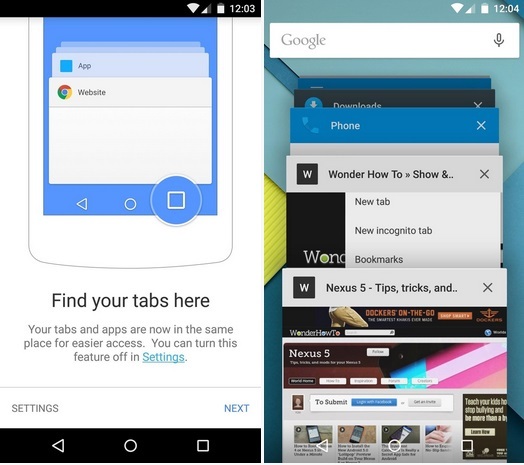 The Recent App menu of the Lollipop version of Android took after the Chrome for Android’s tab view. The Chrome tab has also now been directly integrated directly into Recent Apps view. The title bar on each of the recent apps can now be set to match a given app’s color scheme. This feature will require an update to existing 3rd-party apps, but is already included on most stock apps. Notifications have been re-imagined in Android 5.0, featuring a new “Head’s Up” mode that won’t steal focus when you get an incoming call while using your device. Pull down from the top of the screen once, and you’ll get to your notification panel as usual. But pull down again, and you’ll find the new Quick Settings menu, complete with new toggles like Flashlight and Auto-rotate. Other system menus have been updated as well, including a new dialog box that expands from the bottom of the screen. 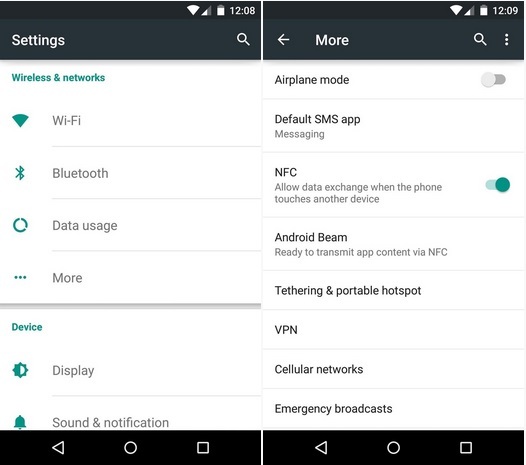 Android’s settings menu has a bright background and a touch of color now. Green accents and simplified switches look to make the experience less intimidating for new users. 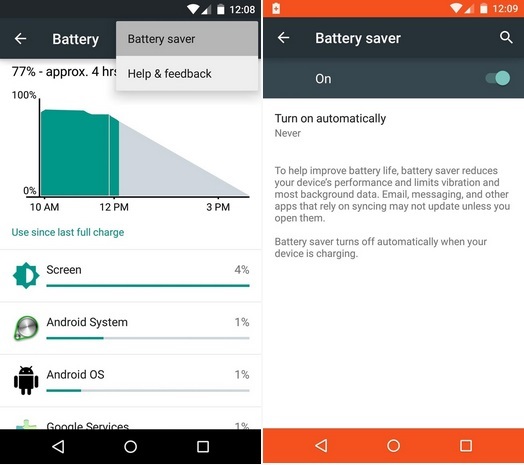 The battery submenu now displays remaining charge in hours and minutes, and a new Battery Saver feature restricts background processes to help squeeze up to an additional 90 minutes out of your device. 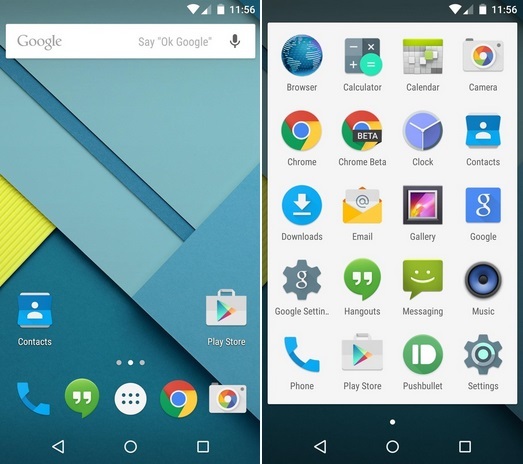 Google has definitely refined its mobile OS with Lollipop, and the end result is both beautiful and fluid. What are your favorite new features? Let us know in the comments section below. I’m a die hard iOS fan – but I simply have to recognize genius when I see it. Unlike Apple, I firmly believe that Google has got this update right and there won’t be any further mishap. Maybe, it’s time to even start thinking Android! I have never really used Android OS – so, I don’t have a list of features I appreciate better in this upgrade!